Toronto police are investigating a video of a woman throwing a chair off a downtown balcony after it was shared thousands of times on social media. Police are investigating after a video surfaced online of a woman throwing a chair off a Toronto condo balcony. 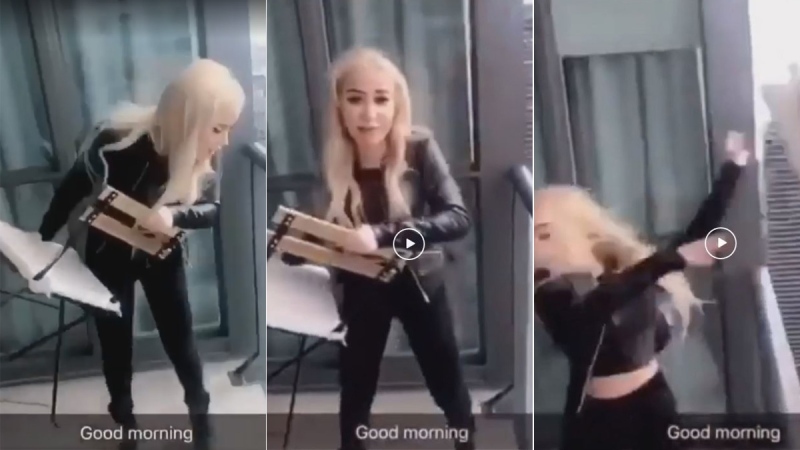 The clip, which has been shared thousands of times on Facebook since Saturday, shows a woman with blonde hair in black leather tossing a metal and wood chair from a condo balcony. The chair falls from several floors above ground, though it’s not clear how high. The Toronto Police Service is asking for the public’s assistance in identifying the woman, who is wanted in a mischief causing danger to life investigation. The roads below appears to be Toronto’s Gardiner Expressway and Lakeshore Boulevard. Apparently taken on the Snapchat video app, the clip is captioned with a “Good morning” message and cuts out before the chair meets ground. Police said there were no injuries and the chair landed in front of a building entrance. It is unclear when the video was taken, but police said in a statement that the incident allegedly occurred around 10 a.m. on Saturday, Feb. 9. It is also alleged that other items were thrown from the balcony as well. In a photo posted on Reddit and shared on Twitter, two chairs that resemble the one in the viral video sit mangled on a sidewalk. Users on social media voiced their disapproval of the woman in the clip over the weekend and into Monday. “From that height that chair could kill someone instantly,” wrote one user on Facebook. CTV Toronto reported that the Toronto Police Service’s cybercrime unit is investigating.